14:16: Today has been an explosion in a subway in the Russian city of St Petersburg. 14:17: The Russian news agency TASS speaks at least ten dead and twenty wounded. It would be an attack with a cluster bomb in two metro trains, reported Russian media. 14:31: The municipality of St. Petersburg says that exploded two subway carriages in two stations. It is thus possible to double taxation. The blast was the Sennaja Plosjad station. After the explosion, the authorities have closed three subway stations. The website Life News showed footage of wounded on the platform and subway doors that were washed away by the explosion. 14:38: Russian President Putin in St. Petersburg right now. He has met with Aleksandr Loekasjenko, the president of neighboring Belarus. Putin made a statement. He says there are dead and injured, and expressed his condolences. 14:41: Bystanders help victims in the subway, so showing a video on Twitter. 14:49: Putin says the cause is not yet known that all options are explored. 14:51: According to news agency Interfax, all subway stations closed in St. Petersburg. 14:51: The governor of St. Petersburg late news agency Interfax know that there are 50 wounded. 14:54: Russian media report that a cluster bomb exploded at Subway Sennaja Plosjad in the center of the city. At the same time there would have been an explosion at the Institute of Technology, the next subway station on the line. 14:58: Pictures on Twitter showing a station filled with smoke. 15:07: Russian media report that a bomb was found not detonated. That would have been found at another subway station where the two explosions. 15:09: Airport Pulkovo Airport in St. Petersburg, in addition to all subway stations, also closed. 15:12: It is not the first time that affected transport in Russia by a stop. – 2015: Bomb explodes in plane en route from Egypt to Russia. All 224 passengers killed. – 2013: Double attack in Volgograd, at the train station and a bus. 32 dead and 85 wounded. – 2011: Suicide Bombing at the arrival hall of Domodedovo airport in Moscow. 37 dead and over a hundred injured. – 2010: Double suicide bombing at Moscow metro. Forty dead, over 100 injured. – 2009: Bomb explodes under high speed train between Moscow and St. Petersburg. Train derailed, fall nearly 30 dead and about 100 wounded. 15:20: According to Russia Today, there are children among the victims. 15:27: There is some confusion about the number of explosions in St. Petersburg. Possibly one explosion between two stations were in and which was therefore heard on both stations. Said stops (Technical University and Sennaja Plosjad) are adjacent. 15:43: The investigation into the cause of the explosion has already begun under the supervision of the Prosecutor General of the Russian Federation. 15:45: The responsibility for the explosion is not claimed, but by Islamic State (IS) -gelieerde channels are shared processed images of President Putin and the city of St. Petersburg. It is still unclear whether there is terrorism. Putin sees it as an option. 15:50: Also Foreign Minister Bert Koenders has responded to the explosion. 15:52: Injured be taken to hospital. According to the Russian news agency Interfax at least 25 people have been hospitalized and did several others injured after a spot-not to the hospital. In the underground of the Russian city of St. Petersburg has been an explosion today. The Russian news agency TASS speaks at least ten dead and fifty injured. It would be an attack with a cluster bomb in two subway trains in two different stations, possibly with homemade bombs. According to the Municipality of Saint-Petersburg are detonated two subway carriages in two stations. Probably with homemade nail bombs. It is thus possible to double taxation. One explosion took place near the metro station Sennaya Ploshchad, the other at the nearby Sadovaya. The stations are both in the center of the city. According to news agency Interfax, all metro stations are closed in St. Petersburg. The website Life News showed footage of wounded on the platform and subway doors that were washed away by the explosion. 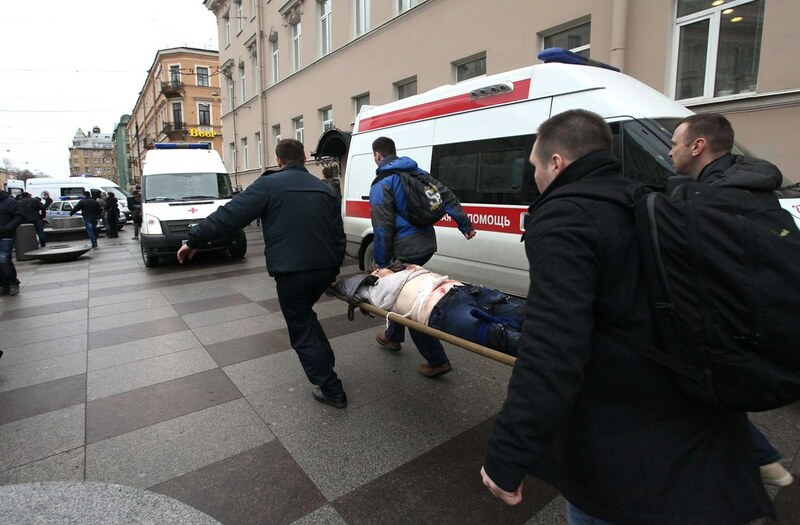 According to the governor of St. Petersburg is about fifty wounded. Russian President Putin is currently in St. Petersburg. He has met with Aleksandr Loekasjenko, the president of neighboring Belarus. Putin has already made a statement. He says there are dead and injured, and expressed his condolences. Russian President Vladimir Poetin has conveyed his condolences to the families of the victims. ,,We consider all possible causes, including terrorism”, said Putin. This entry was posted in Documentation and tagged Attack, Metro, Sint Petersburg. Bookmark the permalink.